The homes of Rupert Stadler and another Audi board member were raided Monday, Munich prosecutors said in an emailed statement. Rupert Stadler is the only active company board member targeted in the probe. The head of Volkswagen AG's Audi brand was named a suspect in the diesel-rigging scandal, making him the highest-ranking active official in a probe that's now focusing on upper management nearly three years after the carmaker admitted to cheating. The homes of Rupert Stadler and another Audi board member were raided Monday, Munich prosecutors said in an emailed statement. Both are being investigated for fraud and falsifying public documents relating to sales of diesel cars in Europe. The second suspect is Bernd Martens, Audi's head of purchasing, according to a person familiar with the investigation who declined to be identified because prosecutors haven't disclosed the name. Martens led a diesel task force at Audi, which was set up to coordinate the handling of the crisis with the parent company. The news hit as Volkswagen was briefing journalists at its Wolfsburg headquarters on efforts to bolster internal compliance and integrity programs, underscoring its struggles to get past the scandal. VW has faced a barrage of investigations and lawsuits since U.S. authorities disclosed in September 2015 that the carmaker had rigged engines on 11 million diesel models to cheat on emissions tests. The company has earmarked more than 25 billion euros ($29.5 billion) to pay fines, settlements and other costs since the scandal came to light. Audi, Volkswagen' largest-earnings contributor, has been linked to all three German criminal probes into diesel rigging. Stadler has previously been implicated by two engineers who are also under investigation. Monday's announcement comes only a month after Audi was raided for a third time. Two former managers at the luxury carmaker are being held in pre-trial detention in Munich. Among them is Giovanni Pamio, who has testified about the rigging allegation at Audi. The Munich probe now extends to 20 people linked to the company. VW spokesman Nicolai Laude said the company won't comment on open investigations. A spokesman for Audi says the unit is fully cooperating with authorities. Stadler's lawyer, Thilo Pfordte, didn't immediately reply to an email seeking comment. A call to Audi requesting a comment from Martens wasn't immediately returned. Stadler, who added the title of head of group sales at VW in April, is the only active company board member targeted in a probe directly tied to the diesel rigging allegations. VW CEO Herbert Diess is being looked at in a different investigation over market-manipulation allegations for failing to disclose the scandal to investors at an early stage. Diess has denied the accusations. 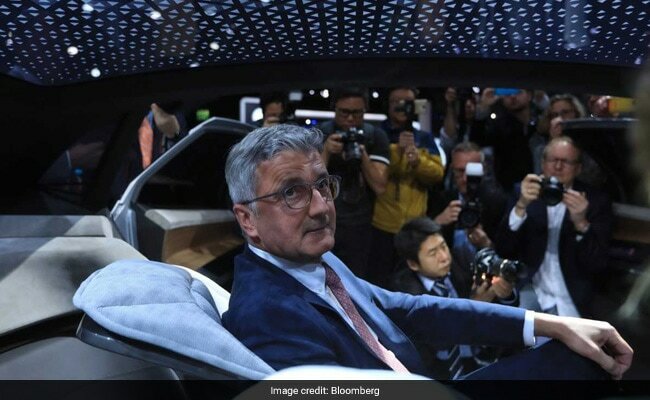 Stadler, who became Audi chief in 2007 and joined Volkwagen's executive board in 2010, survived several recent management overhauls despite emerging allegations that he was informed about the scam. At the journalists briefing in Wolfsburg, Hiltrud Werner, VW board member in charge of integrity and legal affairs, presented a program dubbed Together4Integrity. The company-wide initiative aims to show that ethical behavior is the responsibility of all employees. The push includes encouraging staff to step forward and report issues. Despite having a whistleblower system in place for more than a decade, Volkswagen received no internal tips of suspicious activity related to the carmaker's diesel vehicles, Werner said. Nearly three years on from the scandal, a suspicion over emissions practices continues to envelop the industry. Daimler AG CEO Dieter Zetsche on Monday is meeting for the second time in as many weeks with Germany's transport ministry to explain irregularities in its exhaust setups in diesel engines.